For the second year running, I have been asked by Stephen Foster, editor of advertising news website, More About Advertising, to ghost-write an article on behalf of one of the site’s more unusual contributors. 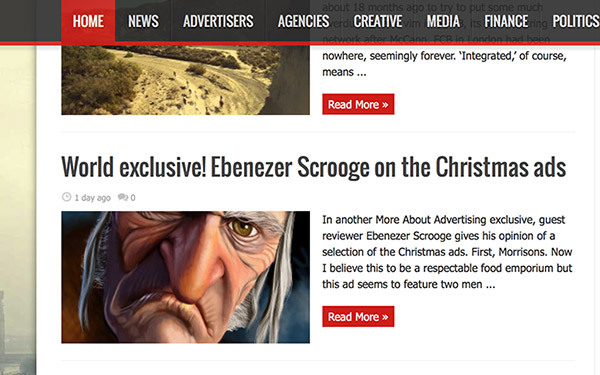 The contributor in question is Ebenezer Scrooge, the Victorian miser. Unlike his creator, Charles Dickens, Scrooge isn’t much of a writer. So the task falls to me. And what a task it is. I have to sit down with the tight-fisted curmudgeon and watch a selection of current Christmas commercials. He then tells me what he thinks of the ads, one by one. I go away and attempt to do justice to Scrooge’s musings by writing a short review of each of the selected commercials. I submit what I have written to Scrooge who goes through my prose making it far more critical of the advertisers and their agencies. I gently explain that I still have to earn a living in this business and that it doesn’t pay to insult some of the best agencies in town. But he rarely budges. Which is why in his latest outing on More About Advertising he knocks Wieden and Kennedy’s work for Tesco, and Adam &Eve DDB’s ad for Harvey Nichols. Mercifully, this year he does give grudging praise to the John Lewis ‘Monty’ commercial, which personally I like a lot, as I do the Harvey Nicks film. To see Scrooge’s review in full, follow this link. Which only leaves me to echo something that Scrooge might quite possibly say: ‘thank goodness Christmas only comes once a year’. Fantastic, another eleven months before I have to ghost-write a review of ads for Victorian England’s best-known miser. Oh, and by the way, if you’re not familiar with More About Advertising, take a look at it. To my mind it’s more entertaining than other ad news websites or magazines – and it’s certainly far more irreverent. Sign up and they’ll send you breaking ad news everyday by email. As if Bernbach never lived. Compare the ads in this book with those that run today.